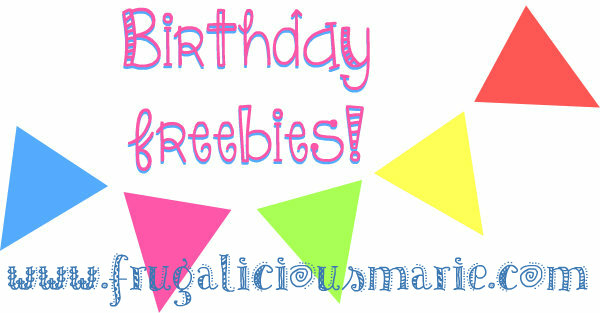 Get Freebies on your Birthday! My birthday is coming up in a few weeks! I will be turning 31!! I'm looking forward to getting a bunch of freebies! Here's what you can get on your birthday. Disney: Register for Disney Movie Rewards and you'll receive a credit for a free Blu-ray movie on your birthday. DSW: Join DSW's rewards program and receive a $5 gift certificate on your birthday. Old Navy: Sign up for Old Navy's email newsletters and you'll receive a free surprise on your birthday. Victoria's Secret: Sign up for their mailing list and receive a coupon for $10 off a purchase of $10 or more on your birthday. Ben & Jerry's: Become a Chunk Spelunker and you'll get a free scoop of ice cream on your birthday. Friendly's: Join their BFF Club and get 25% off on your next visit just for enrolling, plus a free sundae on your birthday. Menchie's: Join the mySmileage rewards program and recieve a $5 credit towards frozen yogurt on your birthday. Applebee's: Sign up to receive their email updates and you'll get a dessert shooter on your birthday. Bennigan's: Become a Bennigan's eClub member and receive a free dessert and buy one, get one entrée on your birthday. Captain D's Seafood Kitchen: Become a Captain D's Seafood Restaurant Insider and receive a free dessert once a week for a month with the purchase of a regular-priced meal, plus more freebies on your birthday. Charlie Brown's Steakhouse: Join their Handshake Club and receive a free gift on your birthday. Chili's: Sign up for their email list and get a free order of chips and salsa or guacamole or queso just for joining, plus a brownie sundae on your birthday. Denny's: Present your valid I.D. to receive a free Grand Slam on your birthday (includes two eggs, two slices of bacon, two sausage links and two pancakes). Don Pablo's: Join their Hab Club and receive a free $10 gift card on your birthday. Famous Dave's: Join the Famous Nation Club and receive something free on your birthday. Houlihan's: Join their email club and $10 off for joining, plus a free entrée on your birthday. Johnny Rocket's: Join the Johnny Rocket eClub and receive a free hamburger on your birthday. P.F. Chang's: Sign up for their email updates and get a free dessert or appetizer on your birthday. Genghis Grill: Become a member of the Khan's Club and get a free birthday stir-fry bowl. Moe's Southwest Grill: Join their eClub and receive a free burrito on your birthday. Schlotzsky's: Join their eClub to get a free small sandwich on your birthday.